Coming off top-10 finishes in the recent Junior National Qualifier at Soldier Hollow, three junior athletes beat out all except one of the best Utah cross-country ski racers on Saturday. Karsten Hokanson, Henry Gorman and Kyle Beling placed 2-3-4 in the fourth Smartwool Wasatch Citizens Series event on an extremely fast track at Mountain Dell. Hokanson and Gorman, Park City Winter Sports School student and November graduate, respectively, ski for the Wasatch Nordic Ski Academy. Parkite Beling is a member of the Park City Nordic Ski Team. 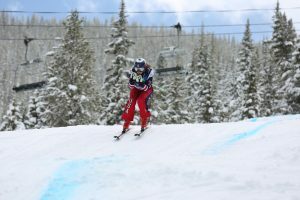 The trio, along with winner Thomas Seidel, were the only skiers to break 30 minutes in the 10.5-kilometer classic-technique race. Seidel and Hokanson came around the last corner neck and neck. 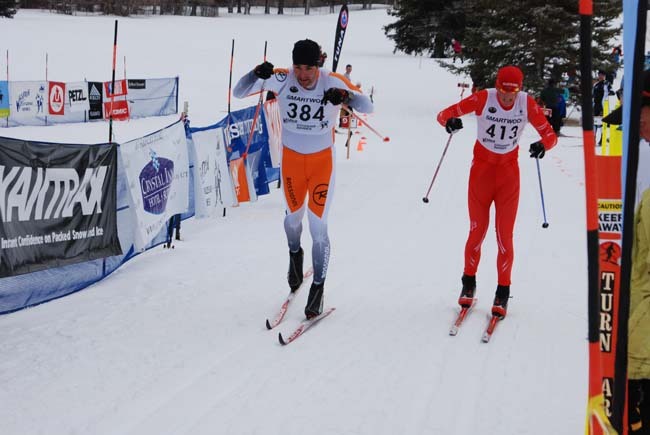 As they furiously double poled to the line, the older skier proved to be stronger in the final sprint. The winning margin was only a few inches, certainly the most exciting WCS finish of the winter. Having recently moved here from his native Germany to do biomedical research at the University of Utah, Dr. Seidel has been cross-country ski racing for most of his life. "I was really pleased to win my first race since arriving in the U.S.," he exclaimed. "It’s taken me quite a while to get used to skiing at such a high altitude." 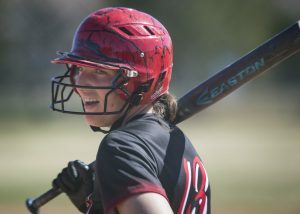 In the women’s division, local veterinarian and mountain bike racer Anita Merbach was runner-up to former University of Denver standout and World Cup competitor Katie Ronsse-Libby. Just out of the medals was veteran Roxanne Toly, who has completed well over 100 Wasatch Citizens Series events over the past three decades. Despite a weather forecast of heavy overnight snow and wind, Mother Nature had better ideas. Groomers were able to grind up an icy base and set near perfect classic tracks for race day, and cloudy skies prevented the snow from getting mushy, as it had been in previous days. Conditions were perfect for fast skiing. One of the closest races of the day was in the 14-15 class, where Park City Nordic Ski Club ace Alex Jackson edged teammate Jesse Reid in the final sprint. Not far behind them was one of the country’s top 14-year-old girls, Leah Lange, who skied the 5.25-kilometer loop in just 17 minutes. This week’s family to beat was the Wilsons, who made a clean sweep. Daughter Sabine won her third race of the series, leading all the other 8-9 year olds (including the boys) by 15 seconds. Mom and Dad, Dodi and Isaac, took home their second blue ribbons of the winter in the 40-45 classes. Other local juniors who came away with medals included Sydney Palmer-Leger, Jenae Rasmussen and Savanna Fassio, who swept the 12-13 class. Recovered from an illness that kept her out of last weekend’s Junior National Qualifier at Soldier Hollow, Sophie McDonald topped Brenna Egan in the 16-17 division. Aiden Rasmussen won his third in a row, with Henry Silverman placing second, among the 10-11 boys. Among the adults, Park City Nordic Ski Team coach Gordon Lange, skiing at a pace almost as fast as his daughter’s, beat Jordan Swenson to the finish in the 55-59’s. Other adult age-group winners from Park City were Kirsten Whetstone, Deborah Wagner, Robert Lazzaroni and Dave Hanscom. Leading the novices were John Fassio and Andrea Putt. The next, and final, event in the Smartwool Wasatch Citizens Series will be a 20-kilometer skate event on Feb. 23 at the White Pine Farm. Shorter courses are available for oldsters, youngsters, and novices, and a free lunch will accompany the awards ceremony. Registration is at St. Mary’s Catholic Church, just north of the farm, from 8:30 to 9:30.